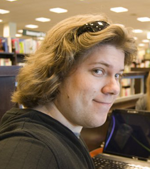 Josh Simpson is a full-time web developer for Advantage Design Group. He specializes in HTML/CSS/PHP with web standards and accessibility. He earned a degree in Graphic Design and Digital Media concentration of Bachelor of Fine Art at University of North Florida. He enjoys teaching high school students in web development and direct a sub-team in a web competition under the FIRST organization. In his free time, he loves going to the beach, kayaking, swimming, and playing online games.